Portuguese pianist Inês Andrade is an avid and versatile soloist and chamber musician. She has performed across Europe and the United States in spaces such as Carnegie Hall’s Weill Recital Hall (USA), Centro Cultural de Belém (Portugal), Teatro Comunale Luigi Russolo (Italy), and Centre Le Phénix (Switzerland). Recently, she was a guest artist at Bay Chamber Concerts, Boston Portuguese Festival, Boston Conservatory New Music Festival, Classical at the Cabot, and CAC Tejo's Autumn Festival. She has been praised for her "lyricism and wonderful musicianship," as well as her “excellent technique and elaborate touch” (Diário de Notícias), after her performance of Grieg’s Piano Concerto with the Lisbon Sinfonietta Orchestra. 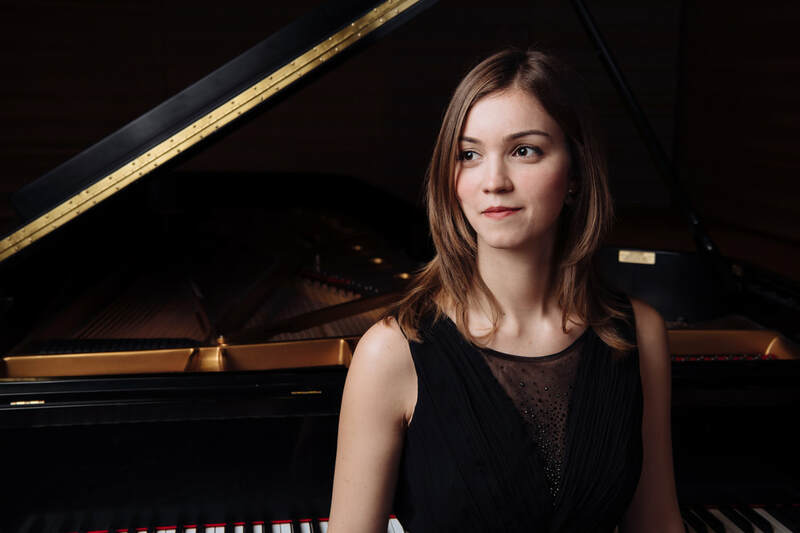 As a winner of the 2013 Steinhardt Piano Concerto Competition, she performed Schumann’s Piano Concerto with the NYU Symphony Orchestra at the Frederick Loewe Theatre (New York). She has also appeared as a soloist with the MPMP Orchestra, the ArtQuest Orchestra, the ESML Symphony Orchestra, the BU Symphonic Chorus, the NYU Percussion Ensemble, and the Lisbon National Conservatory Orchestra. Inês has performed in masterclasses with John Perry, Jerome Lowenthal, Jerome Rose, Vitaly Margulis, Boris Berman, Mikhail Voskresensky, Solomon Mikowsky, Jeffrey Swann, Galina Eguiazarova, Ferenc Radus, Marc Durand, Peter Donohoe, and Alexander Kobrin and participated in the International Piano Festival in Paris (France), the Festival e Academia Dino Ciani (Italy), the Gijon International Piano Festival (Spain), and the Obidos International Piano Master-Classes (Portugal), among others. A passionate chamber musician, Inês is a prizewinner of the Portuguese Young Musicians Prize, in duo with violinist Tamila Kharambura. The duo recently recorded “Quasi una Sonata” by composer António Pinho Vargas, which was released by MPMP in 2017. Inês also founded Duo Pianissimo, with pianist Marta Menezes, to celebrate and disseminate Portuguese music written for two pianos. She collaborates regularly with ALEA III and is a member of the ensemble Virtuoso Soloists, which was founded in New York City in 2014. Virtuoso Soloists has performed extensively in the United States, Italy, and Portugal. The ensemble recorded an album with music by acclaimed Italian composer Mario Pagotto, which was released by MEP Italia in January 2018. Inês Andrade holds a Bachelor of Music and Master’s degrees in Piano Performance and Pedagogy from Escola Superior de Música de Lisboa (Lisbon, Portugal), under the guidance of Miguel Henriques. During her studies in Lisbon, she was named the Most Outstanding Student of the Year in 2008 and 2010. She moved to the United States in 2011 and continued her musical studies at New York University, where she studied with José Mendez and Marilyn Nonken. Inês graduated last May with a Doctor of Musical Arts degree from Boston University, under the tutelage of Pavel Nersessian (piano) and David Kopp (music theory). She was distinguished by the Boston University Women’s Council and invited to join the National Music Honor Society Pi Kappa Lambda. Her dissertation project, “Tradition and Innovation in the Piano Works of Portuguese Composer António Fragoso,” won a Graduate Arts Research Grant from the BU Arts Initiative. ​Besides being a performing artist, Inês has been dedicated to the research of Portuguese music. After completing her doctoral dissertation, she was invited to publish a critical edition of the complete works of António Fragoso at AvA Musical Editions. She has also written an article for Revista Glosas and was featured in the documentary "A Vida Breve de António Fragoso," produced by Laurent Filipe for RTP, the main Portuguese TV channel. ​Inês has taught piano, keyboard harmony, and ear training at New York University and Boston University. She is currently on faculty at the EKS Music School and the Kingsley Montessori School, and teaches piano and music theory privately. As a collaborative pianist, she works with several singers and instrumentalists in the Boston area. Inês is the founder and Artistic Director of the Bendada Music Festival, a youth summer festival in Portugal that won the CFA Spark Grant 2017 and has been featured at BU Today and Bostonia. ​Her upcoming projects include a commercial recording of António Fragoso’s complete chamber music works and a tour of China in Summer 2019.​​ Inês will be a Speaker and Panelist at IDEA 2019: Embrace Your Impact at BU's Questrom School of Business.